Polycystic kidney disease (PKD), a common genetic cause of chronic renal failure, is characterized by accumulation of fluid filled cysts in the kidney and other organs. PKD can be inherited as an autosomal recessive (ARPKD) or autosomal dominant trait (ADPKD). ARPKD is relatively uncommon and occurs primarily in neonates and children. The incidence range of ARPKD is one in 6,000 to one in 40,000 live births. , It is characterized by cystic dilatation of renal collecting ducts with hepatic abnormalities consisting of bile duct dysgenesis and periportal fibrosis. , ADPKD is common affecting both children and adults. It is reported that in India, 5% of conservative estimate of 0.1 million new cases of end stage renal disease are caused by ADPKD. There are no studies reporting the problem statement of PKD in India. A 21-year-old female patient, presented at 22 weeks of gestation for a routine antenatal check up. She was G2 A1. Ultrasound examination revealed a single live fetus with breech presentation. Fetal heart rate was 153 beats/min. Period of gestation estimated was 22 weeks and 2 days. Amniotic fluid was markedly reduced consistent with severe oligohydramnios. Placenta was posterior and fundal. On biophysical profile, fetal movements, fetal tone, and breathing were normal but the amniotic fluid index was inadequate. Crown rump length was 19.4 cm. Bilateral symmetrically enlarged, echogenic kidneys filling the fetal abdomen were seen. The urinary bladder was not visible. There were no other anomalies noted and fetal liver was normal. Umbilical cord blood flow was intact. Gene mapping was not done. There was no history of consanguinity amongst the parents. On evaluation, there was no family history of renal diseases on the maternal or paternal side. The patient and the family were counseled about the possibility of autosomal recessive polycystic kidney disease and opted for termination of pregnancy. 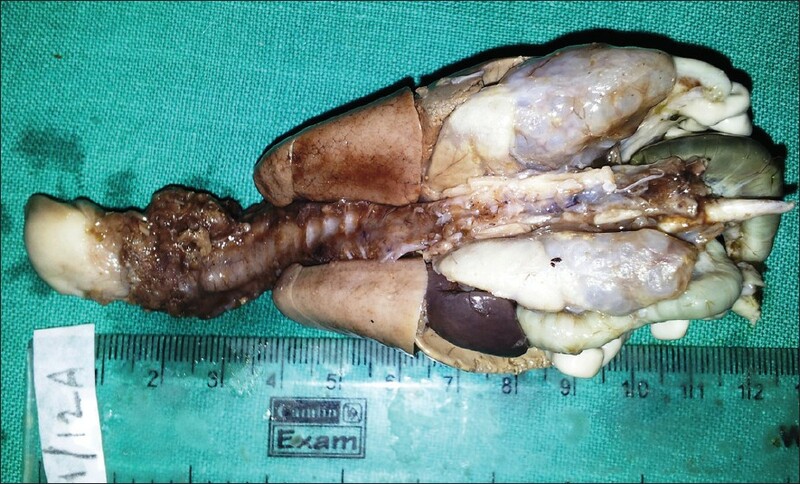 A male fetus with no gross enlargement of abdomen was delivered. Fetal autopsy was done. Both upper and lower limbs were normal and there were no amniotic bands. The spine was normal. The fetus had a pink color to it and there were no facial deformities. Head circumference was 23 cm and abdominal circumference was 17.5 cm. The fetus did not show any signs of intra uterine growth retardation. The abdomen was opened. On gross examination, liver and intestines were normal in appearance. Kidneys on both sides were lobulated and enlarged each measuring about 4 × 2 × 1 cm. The cut surface showed numerous cysts in both the kidneys. The cysts were subcortical. The cortico-medullary junction was not distinct due to cystic transformation of medulla causing distortion of renal columns [Figure 1] and [Figure 2]. 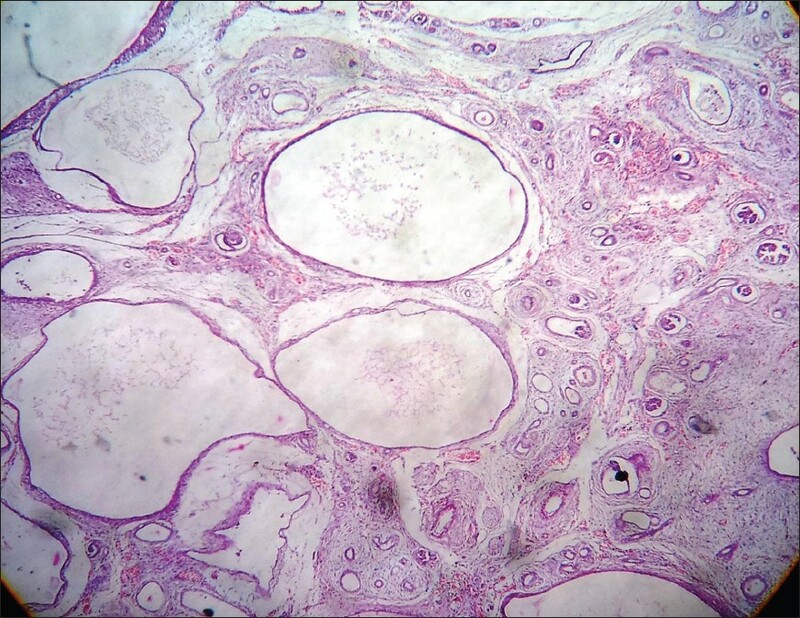 Microscopy of both kidneys showed numerous cysts lined by a single layer of flattened to low cuboidal epithelial cells with thick peritubular mesenchyme [Figure 3]. No difference was appreciated in the histology of proximal and distal convoluted tubules Occasional glomeruli were seen and appeared normal. Liver showed normal histology. The gross and microscopic features were in favour of ARPKD with no accompanying hepatic portal fibrosis and pulmonary hypoplasia [Figure 1], [Figure 2] and [Figure 3]. In our case, the polycystic kidney disease was thought to be an autosomal recessive form and the family carries a 25% risk of occurrence with each pregnancy as the polycystic kidney disease has not been observed in the parents and previous generation, the mode of inheritance may be autosomal recessive or may be a new mutation. The kidney develops from two sources, one in the mesoderm of sacral part of nephrogenic cord and other from the ureteric bud, a diverticulum arising from the mesonephric duct. Further, development involves epithelial mesenchymal interaction. Epithelium of ureteric bud interacts with mesenchyme of metanephric blastema. The mesenchyme expresses a transcription factor that makes this tissue competent to respond to the induction of ureteric bud. In the autosomal recessive polycystic kidney disease, cysts occur from collecting ducts, due to deficient or non-responsive cell adhesion molecules, syndecan and E-catherin which are essential for condensation of mesenchyme to epithelium (Sadler, 2006). The gene PKHD1, on short arm of chromosome 6p21 responsible for ARPKD is linked to ciliary dysfunction. ,, The autosomal recessive polycystic kidney presents as bilateral enlarged kidneys and severe renal failure. In the present case also the kidneys were bilaterally enlarged. Quite et al., (2005) observed that histologically kidney showed simple cysts lined by a single layer of epithelial cells. 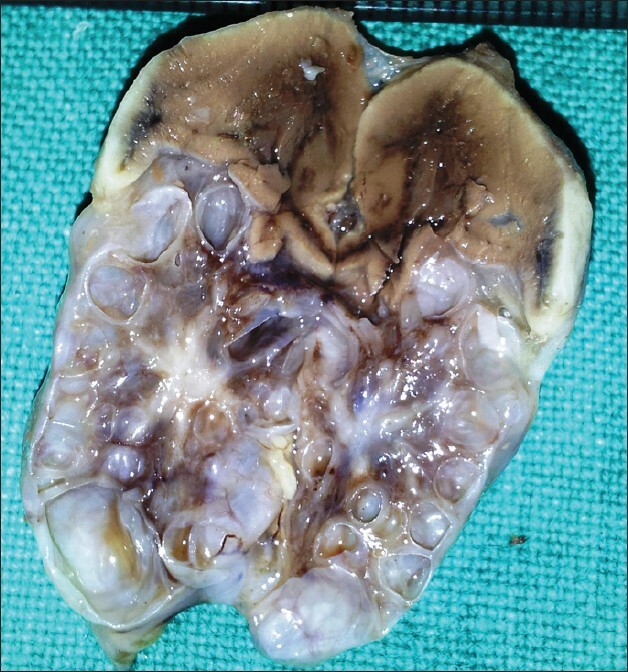 The present histological study also confirms the cysts with single layer. Although the antenatal diagnosis of fetal anomalies has improved largely due to the availability of high resolution ultrasound equipments, still cystic kidneys discovered incidentally during routine antenatal ultrasonography frequently pose significant diagnostic dilemma. There are diverse etiologies with equally variable implications for prognosis in the affected fetus. Correct and timely antenatal diagnosis of polycystic kidney disease with associated fetal anomalies is important so that proper counselling and appropriate obstetric and paediatric management can be extended. 1. Zerres K, Rudnik-Schöneborn S, Deget F, Holtkamp U, Brodehl J, Geisert J, et al. Autosomal recessive polycystic kidney disease in 115 children: Clinical presentation, course and influence of gender. Arbeitsgemeinschaft für Pädiatrische, Nephrologie. Acta Paediatrica 1996;85:437-45. 2. Zerres K, Mücher G, Becker J, Steinkamm C, Rudnik-Schöneborn S, Heikkilä P, et al. Prenatal diagnosis of autosomal recessive polycystic kidney disease (ARPKD): Molecular genetics, clinical experience, and fetal morphology. Am J Med Genet 1998;76:137-44. 3. Rao BN, Padmini MP. Polycystic kidney in foetus. Peoples J Sci Res 2010;3:19-22. 4. Habif DV, Berdon WE, Yeh MN. Infantile polycystic kidney disease: In utero sonographic diagnosis. Radiology 1982;142:475-7. 5. Sakhuja V, Kohli HS. End-stage renal disease in India and Pakistan: Incidence, causes and management. Ethn Dis 2006;16 (2 Suppl 2):S2-23. 6. Thomas J, Manjunath AP, Rai L, Kudva R. Autosomal recessive polycystic kidney disease diagnosis in fetus. Indian J Urol 2007;23:328-9. 7. Alpers CE. The kidney. In: Kumar V, Abbas AK, Fausto N, editors. Robbins and Cotran Pathologic Basis of Disease. 7 th ed. Philadelphia: WB Saunders; 2005. p. 955-1021. 8. Niaudet P. Autosomal recessive polycystic kidney disease. Orphanet encyclopedia; 2004. 9. Chaumoitre K, Brun M, Cassart M, Maugey-Laulom B, Eurin D, Didier F, et al. Differential diagnosis of fetal hyperechogenic cystic kidneys unrelated to renal tract anomalies: A multicenter study. Ultrasound Obstet Gynecol 2006;28:911-7. 10. Debnath J, Singh BH, Kapur K, Bhattacharya TK. Multicystic Dysplastic Kidneys: Antenatal Diagnosis. MJAFI 2004;60:310-1.